It contains pate in a reusable crock, Saucisson (a dry, French peppercorn sausage rolled in Herbes de Provence), Cornichon (small French pickles), Dijon mustard, mini toast, apples and pears. 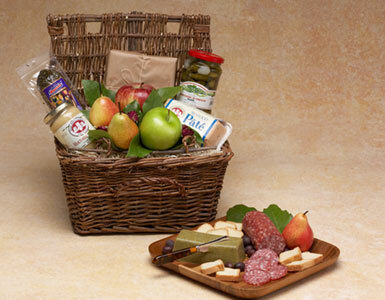 We offer gourmet meat baskets, gourmet pate baskets, meat and fruit baskets, gourmet foods basket, salami pate gifts, meat gift basket, and gourmet deli baskets. We guarantee prompt gourmet foods basket delivery in Beverly Hills, West Hollywood, Santa Monica and greater Los Angeles area.